This coat of arms, or family crest ring, was designed in modern times with a band of 28 round brilliant cut diamonds that weigh approximately .25 carat total weight. These diamonds are set in a scroll pattern around the top of the ring. The hand carved details of the design is incredibly detailed with attention given even to the background of the shield to make the regal crown stand out. Looking behind the crest of the inside of the ring is a lion set with a single round ruby. Made of 18 karat white gold this ring is currently a size 7 and can be sized. 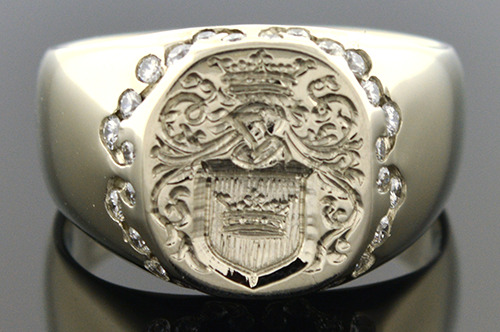 Take a look at the Hand Carved Gents Family Crest Ring also, item #4547.